FDA Compliance Reference from C.H.I.P.S. 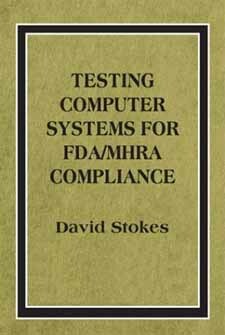 Testing Computers Systems for FDA/MHRA Compliance focuses on software module, software integration, hardware, and system acceptance testing. Reflecting the renewed emphasis of the FDA and other global regulatory agencies towards systematic inspections and risk-based validation with an underlying scientific rationale, this guide focuses on current best practices in computer systems testing in the regulatory environment. It demonstrates how the principles detailed in the GAMP 4 Guide can be used to define a pragmatic approach to testing. It also includes techniques for testing large Internet-based systems for compliance with the stringent requirements of regulations such as 21CFR Part 11, and clarifies the relationship and responsibilities of the system "user" and "supplier". The author delineates where testing starts in the project lifecycle, who performs what testing, where the lines of responsibility start and end, and the differences in the terminology used in the healthcare and general IT sectors. A checklist of questions to be used when developing System Test Specification(s), and templates for documenting typical system test results, round out the features that make this book a practical guide for all those involved in the development and implementation of IT systems for the pharmaceutical and related healthcare manufacturing industries. Senior managers, team project leaders, project team members, and industry trainees, will all benefit from this clear and practical guide. When this Guideline is Applicable? Who this Guideline is Intended for?